Avast Premier Easter 2019 Giveaway! Avast Premier is one of the most robust security suite for any user who wants top-of-the-range protection features alongside having one of the most trusted security engines in the world. With a comprehensive and complete range of security and performance features the user can relax with the assurance that he and his family will stay protected at all fronts. Avast embraces the commitment to protect the user with the most modern system of threat detection including core processes such as structural analysis, behavioral scanning and cloud-based intelligence. Avast with its 2019 product line addresses 3 main aspects of PC protection, (1) Protection, (2) Performance, and (3) Privacy. This is Avast's number one priority. The 2019 line of Avast security solutions feature an added emphasis on some of the most predatory malware issues, including the growing ransomware threat our users now face. With CyberCapture unknown files are isolated in a safe environment and automatically establishes a communication with Avast Threat Labs. This “immediate" is a first-response line of defense protecting the user from new, never before reported threats. Real Site (available in paid versions like Avast Premier) encrypts traffic between an Avast-protected device and their DNS server thus only authenticate/genuine sites are used by the user. This feature is essential especially when doing online banking and shopping. The Core Shields composed of Web Shield, File Shield, Mail Shield, and Behavioral Shield offers the strongest security without having to sacrifice inconvenience plus Ransomware Shield going a step further in protection to stop/halt untrusted apps from changing, deleting and encrypting the user's files/documents. What good is protection that bogs down your computer? Avast has packed some of the world’s most advanced security features into a lightweight application that’s specifically designed not to slow down the user's PC. Avast’s new Do Not Disturb Mode silences notifications while you’re running an app in fullscreen keeping the user focused with his endeavors without distractions. In Avast Premier and Avast Ultimate, "Software Updater" has been automated assisting the user and updating all apps. Cleanup has improved optimization scans to detect unnecessary apps, issues affecting performance and irregular system settings. Avast recognizes that "privacy" is a paramount concern to all its users, so they have gone out of their way to protect them from prying eyes with new features like Avast Premier's always-on Webcam Shield. Avast Passwords makes managing passwords safe and convenient. Avast Passwords can be used either exclusively on the user’s PC, with all data stored there, or it can be synced across all of the user’s devices. Avast Premier’s Data Shredder, encrypts deleted data, so even if it’s recovered, no one can extract anything from the files. The User Interface has been made more user-friendly, "simply" ensuring the product remains easy to use. The design is uniform across the entire client, and separates all our products into three main categories (protection, performance, and privacy) also informative tabs quickly and clearly identify the product and its functions, and each product follows a simplified flow that reduces the number of clicks it takes to get the results the user is looking for. Avast Premier! Top of the range PC protection that covers every corner!!! Web Shield is an additional layer of active protection in Avast Premier and scans the data that is transferred when the user browses the internet in real-time to prevent malware, such as malicious scripts from being downloaded and run on the user's system. Avast's Web Shield technology scans HTTPS sites for malware and other dangers without any man-in-the-middle (MITM) methods and offers the strongest HTTPS security without having to sacrifice convenience by verifying website certificates rather than replacing them. HTTPS scanning detects and decrypts TLS/SSL-protected traffic. Additionally, this feature adds compatibility for SPDY+HTTPS/HTTP 2.0 traffic. File System Shield is the main layer of active protection in Avast Antivirus. It scans programs and files saved on your PC for malicious threats in real-time before allowing them to be opened, run, modified, or saved. If malware is detected, File System Shield prevents the program or file from infecting your PC. By default, File System Shield is configured to provide optimal protection when switched on. We therefore strongly recommend you keep this Shield turned on at all times and only make configuration changes if you have an advanced understanding of malware protection principles. Mail Shield is an additional layer of active protection in Avast Premier and scans the user's incoming and outgoing email messages for malicious content. Scanning applies only to messages sent or received suing the mail management software (email clients such as Outlook, Mozilla's Thunderbird and the like). If the user uses a web-based email account via the internet browser, his PC is protected by the antivirus shields. Behavioral Shield is an additional layer of active protection in Avast Premier. It monitors all processes on the user's PC in real-time for suspicious behavior that may indicate the presence of malicious code. Behavioral Shield works by detecting and blocking the suspicious files based on their similarity to other known threats, even if the files are not yet added to the virus definitions database. By default, it is configured to provide optimal protection when switched "on". It is strongly recommended that this shield be kept "on" always and only make configuration changes if the user has advanced understanding of malware protection principles. The Avast Firewall, offers better outbound protection and configurability than Windows, while remaining nicely invisible to the user. The silent Firewall also uses crowd-sourced data from our 400 million global users to identify what file types and applications are whitelisted, even those from remote corners of the world. The firewall feature is available in Avast Internet Security and Avast Premier. The Avast Firewall monitors all network traffic between your PC and the outside world to protect you from unauthorized communication and intrusions. This feature is designed to require minimal input from you. 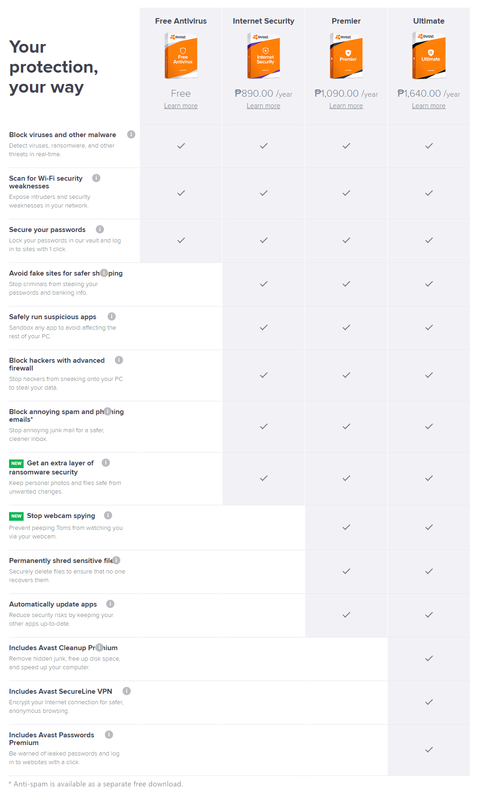 To ensure you are protected, all you need to do is keep Firewall enabled and, when prompted, select the appropriate Firewall profile for each network you connect to. Ransomware Shield secures the user's personal photos, documents, and files from being modified, deleted, or encrypted by ransomware attacks. This feature scans for and automatically secures folders which may contain personal data and allows the user to specify which other folders he wants to protect from untrusted applications. Additionally, he (the user) can specify which applications are allowed to modify the files in your folders and which applications are always blocked. Ransomware Shield monitors all processes on the user's PC in real-time for suspicious behavior that may indicate the presence of malicious code. Behavioral Shield works by detecting and blocking the suspicious files based on their similarity to other known threats, even if the files are not yet added to the virus definitions database. 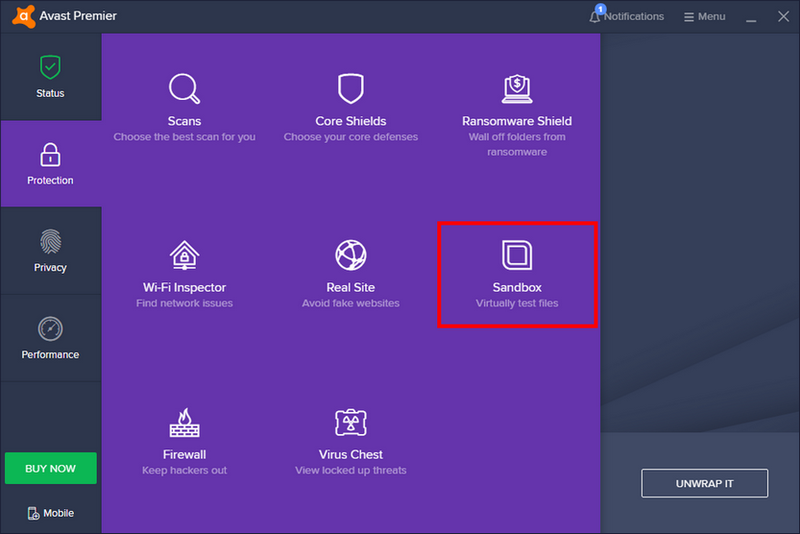 The Avast Sandbox is a virtual space that allows users to run files safely, separated from the rest of the user's PC. It is a special security feature which allows you to run potentially suspicious applications automatically in a completely isolated environment. Programs running within the sandbox have limited access to the user's file and system, thus there is no risk to the user's system and to this files. This feature is also connected to the FileRep cloud feature which identifies new files for additional analysis. Thus Avast will be able to warn the user before even testing the file via their Virus Lab. When Avast detects anything suspicious it will automatically run the application in the Sandbox. The advantage of running an application in the Sandbox is that it allows the user to check suspicious applications while remaining completely protected against any malicious actions that an infected application might try to perform. There is a "color border” that will show when a particular application is being run inside the Sandbox. When the Sandbox is closed. It will be restored to its original state and any downloaded files or changed browser settings will be automatically deleted. Smart Scan lets users scan for a plethora of issues with one click and to discover features that could further improve their PC. It is a comprehensive scan that detects malware, outdated software, bad browser add-ons, network threats, performance issues, and weak or compromised passwords at the same time. To speed up the scanning process, Smart Scan combines all scanning (for viruses, software updates, network problems, new features and performance issues) into one concentrated scan. Once completed, it shows the itemized results and, if there are any issues, offers tools and suggestions to fix them. If you run a predefined antivirus scan and it detects a suspicious file. If an active Core Shield detects a suspicious file. Note: The user can also access the Virus Chest feature by right-clicking the Avast icon in your system tray and selecting Virus Chest. From the Virus Chest feature screen the user can manually move files to the Virus Chest. Avast's Wi-Fi Inspector sports a new, sleeker look making it easier to use. This feature identifies weak passwords, vulnerable routers, compromised Internet connections, and enabled, but not protected, IPv6. It lists all the devices on the network so users can make sure that only trusted devices are connected. If an issue is found, we’ll offer solutions for how to fix it to keep you safe on both public and private networks. This proactive approach to security highlights our ongoing commitment to provide users with 360 degrees of protection that extends beyond the device to the user's Wi-Fi landscape, both now and in the future. Data Shredder allows the user to irreversibly erase his files or whole drives, so that there is no way for anyone to restore and misuse your data. When a user erases a hard drive, or delete a file using standard tools, only a reference to its data is removed from the file system. Simply deleting sensitive files, such as user data or licensed software, may not be safe as there are tools capable of restoring deleted files. Data Shredder overwrites files with meaningless data multiple times before deleting them, which prevents data from being recovered. Data Shredder is especially useful when selling or donating your computers and hard drives. Note: Data Shredder is available in Avast Premier. Avast Passwords is a password and data manager that allows the user to securely store sensitive information in one place. It makes managing your passwords safe and convenient. Avast Passwords can be used either exclusively on the user’s PC, with all data stored there, or it can be synced across all of the user’s devices (PC, Android, iOS, and Mac). If it is, all data is encrypted and stored on Avast’s secure servers as well as on the user’s local hard drive. Approximately 80% of all users have passwords stored on their browser, where they are easy for spies and hackers to access. Most users either aren’t aware of the danger or are too fond of the convenience to care. Avast Passwords, however, offers the best of both worlds — it keeps the user’s passwords and credit card details in one convenient location, locked behind one master password. When unlocked, and when the accompanying web add-on has been installed on a browser, Avast Passwords will auto-fill a user’s information every time they go to log into an account online with the same speed and convenience as a browser. Avast Passwords also comes with several other features, such as Secure Notes, which is a digital notepad safely hidden away from the rest of the world. And for premium users, Avast Passwords can monitor if any of their passwords have been leaked by comparing them to a database of stolen passwords, and warn the user if their accounts are vulnerable, so they can change their passwords. According to an Avast survey, only 63% of users around the world took action after being affected by a data breach. Users can also access all their online accounts across all their devices with the convenience of One-Touch Login, which lets them unlock their Avast Passwords with one touch on their phone. SecureLine VPN is a Virtual Private Network (VPN). A VPN functions as a private tunnel through the internet, which encrypts your data and secures your connection when using public Wi-Fi connections such as those in cafes or airports. SecureLine VPN has servers in several locations, which means you can bypass geolocation restrictions and access your favorite content while traveling. Note: A SecureLine VPN license is not included in Avast Premium. The user can purchase a separate SecureLine VPN license to use the component in all other versions of Avast Antivirus. Sensitive Data Shield provides an extra layer of spyware protection, beyond what the free antivirus offers. Using advanced algorithms, it scans your computer for documents containing names, addresses, phone numbers, and other data it thinks you’d want to keep private. If it finds any, it will offer to seal them off from unknown apps and spyware. There’s no need to move your files or hide them in a secret folder, either. Sensitive Data Shield keeps everything right where you left it, and protects it all automatically. With Sensitive Data Shield, only trusted apps (e.g., Adobe Reader, Microsoft Word, etc.) can access or copy your private documents. Anything else is automatically blocked — unless you approve. Webcam Shield prevents applications and malware from accessing the user's webcam without your consent. With Webcam Shield enabled, untrusted applications cannot capture images or videos and send the content outside of the user's PC to compromise your privacy. Webcam Shield is enabled by default. To disable this feature, click the green ON slider so that it changes to red and displays the text OFF. Avast recommends keeping Webcam Shield enabled at all times. This feature is available in Avast Premier. Cleanup Premium includes a range of PC optimization scans, which detect unnecessary programs, performance issues, and unusual system settings to free up disk space and improve the speed and condition of your PC's system. Note: Cleanup Premium is not included in Avast Premium. The user can purchase a Cleanup Premium license to use the program as standalone product. In all versions of Avast Antivirus, the user can run an initial Cleanup scan to view issues on your PC and then select whether to resolve the issues by purchasing a license and installing Cleanup Premium. Do Not Disturb Mode is a "new" feature in Avast Antivirus. Do Not Disturb Mode works to silence unnecessary notifications while the user runs almost any application in fullscreen. Each time the user opens an application in fullscreen mode, Do Not Disturb Mode automatically detects it and adds it to the list of applications. Do Not Disturb Mode automatically launches to silence notifications from Windows, Avast Antivirus, and other application. Do Not Disturb Mode is a re-design of our previous “Game Mode” feature, which was limited to only fullscreen games. This new feature works with nearly any app running fullscreen and is included in all our antivirus offerings, from Avast Free Antivirus to Avast Premium. Software updates can be a real hassle, as they interrupt work and disrupt system functions. Because they can be so annoying, many users postpone installing them, which leaves their devices vulnerable. Many PC users are not aware that cybercriminals take advantage of vulnerabilities in outdated, commonly used software such as browsers, Flash Player, Skype, and other programs. Through security flaws, hackers can access a user’s system to install malware like spyware and adware, which can affect performance and, perhaps most importantly, lead to identity theft. Therefore, it is important to keep software updated. Avast makes this chore much easier with “Software Updater”. Helping users update faster than ever, Avast lists all the out-of-date programs and applications on the device and allows users to update them with a single, convenient click. For Avast Premier users, updates can be downloaded and installed automatically and unobtrusively, through our own system servers, so as to not disturb system functions. All this so our users can relax knowing the most vulnerable holes in their PC’s security are covered. Avast’s CyberCapture technology is one of our newest proprietary features that allows us to detect unknown files that might be a threat and analyze them in real-time. Whereas older technology ran locally on the user’s PC, CyberCapture runs in the cloud to provide zero-second protection, detecting unrecognized files quickly. At its core, CyberCapture is a cloud-based smart file scanner. Rather than relying on the latest definition updates, CyberCapture isolates unknown files in a safe environment and automatically establishes a two-way communication channel with the Avast Threat Labs. This allows for immediate analysis, providing a first-response line of defense against new, never before reported threats. To analyze the file, Avast clears away all the false code and misdirection that malware creators use to mask malware’s true intentions. By peeling away layers of obfuscated code, CyberCapture is able to observe the binary level commands inside malware and better understand the instructions hidden there. While CyberCapture is analyzing, a user can run the file before CyberCapture has finished; however, we strongly recommend against this. Once a file has been analyzed, Avast tells the user whether the file is safe or dangerous. Phishing is big business, and it’s only getting bigger. Leading security companies and major carriers are noting dramatic increases in consumers falling prey to phishing lures. In 2017, Verizon reported that even after training, one in 14 users was attacked with spear phishing, spoofing, or impersonation emails or mobile text messages. In light of this, we’ve tuned up our anti-phishing feature to deliver more advanced protection. With enhanced anti-phishing technology, your browser can now identify phishing sites without the need for a browser extension. Quicker scans now occur every five minutes ensuring safer browsing, without any delays to the browsing experience. Real Site is a feature that protects the user from DNS (Domain Name System) hijacking to ensure that he (the user) access the "actual-real site" that he wants to visit. DNS hijacking is an attack that redirects the user from the site that he wants to visit to one that is fake. This type of attack is dangerous when used with banking and shopping websites. Avast's Real Site provides an encrypted connection between the user's web browser and Avast’s own DNS server to prevent hijacking. Real Site (previously called Secure DNS) is available in all of Avast’s paid antivirus products to encrypt the traffic between an Avast-protected device and our DNS server. This way, users can relax knowing that they’ll always go to the right destination every time. Avast Passive Mode allows you to run the tools you want alongside the Avast solution with ease. Passive Mode triggers automatically when another antivirus program is installed with Avast already on the system. When activated, Passive Mode shuts down our active shielding components and Firewall, which allows Avast and an alternative antivirus to share the same system space without competing. Thus, users can enjoy our scans and other tools alongside another antivirus solution chosen for real-time protection. Passive Mode can be toggled on and off manually from the settings, regardless of the presence of another antivirus on the system. However, we don’t ever change the settings of any other antivirus currently on your machine, so turning Passive Mode on without manually turning on another security program may leave your PC without active protection. It may seem counter-intuitive to be willing to shut down our own protection to make room for another, but we feel flexibility and inclusivity allow our users greater control over their devices. 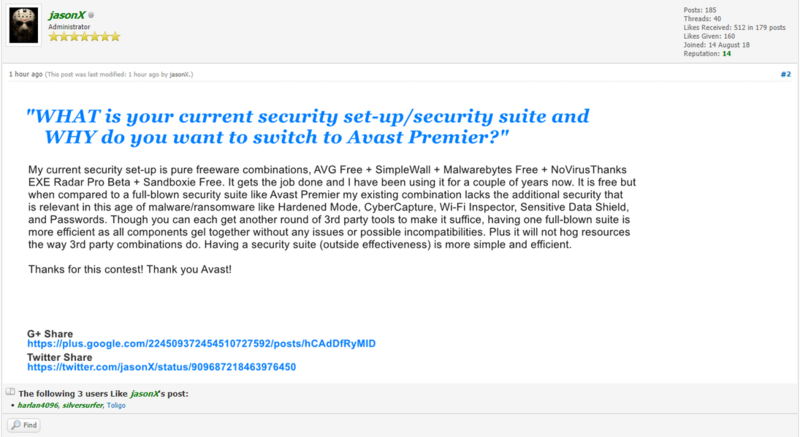 "WHAT is your current security set-up / security suite and WHY do you want to switch to Avast Premier?" Optional: You may want to like/follow Avast Software's social networking sites as added support. It is understood that you will NOT trade your winning license and you will NOT shelf it for a period of time. All winner details will be sent to the sponsor for documentation. WHAT is your current security set-up / security suite and WHY do you want to switch to Avast Premier? I am currently using Panda Dome but it expires shortly and I would love to switch back to Avast, as I have had the pleasure of using Avast Internet Security before, but never their Premier Security experience! I enjoy the familiarty and security of Avast. Thanks for a great software giveaway Avast! I have Avast Free + Comodo Firewall (no HIPS) + Malwarebytes Free + NVT Smart Object Blocker + Zemana Antimalware free (Portable). This setup can do the job well but still having suite is better because it is much simpler to use and no fuss or less tendency to have conflict with other security because I will only have one suite to handle all. Thanks for this contest! Thanks also to Avast! I use Windows 10 OS in my laptop. So, I never used any kind of third-party antivirus as there is Windows Defender which is doing a decent job. But there is a problem i.e. a service called 'antimalware service executable' continuously runs in background causing the almost 100% disk usage. Then I decided to switch to antivirus system. For few weeks, I am using Avast premier trial version which is soon going to expire. It solved my problem and it was a great user experience. Thanks for this contest! Thank you Avast! I am currently using Windows Defender + Zemana AntiLogger Pro and want to upgrade to Avast Premier because it is an enhanced version of Avast Internet Security that includes additional features: webcam protection, file shredder and automatic program updates. Avast Premier has a number of modules that are enclosed in a single shell and allow you not to install additional protection programs. Avast Premier uses cloud technologies and virtualization (automatic sandbox), protection against ransomware, password Manager, as well as CyberCapture - an innovative feature that allows you to detect unknown dangerous files. Avast Premier because it is a comprehensive software that protects your computer against dangerous viruses, hackers, spyware and other threats lurking in the network. avast! The Premier also protects the system against worms, trojans, phishing and provides additional protection of private user data. I am currently using KIS 2019 in one of my laptops and would like to use/win Avast Premier as it is very light and provides top class protection against all internet threats. Current time: 20 April 19, 10:33 Powered By MyBB, © 2002-2019 MyBB Group.